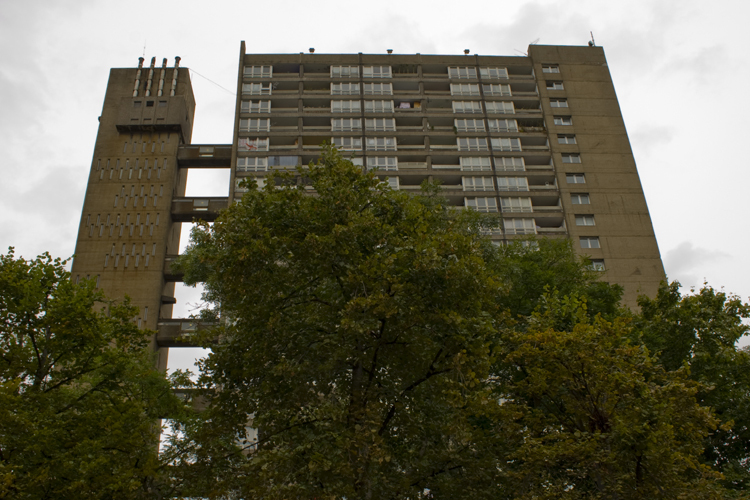 The second part of my Open House London runnaround was a visit to Balfron Tower in Poplar, East London. I was originally planning a viewing at Trellick Tower, on the opposite side of town in the affluent W10 postcode but it was obviously booked out the very minute reservations started to take place on the website. The alternative then was to go and check its predecessor in far less glamorous surroundings instead. It is impossible to ignore the complex of building’s presence in contrast to other estates around it. Despite its derelict look the whole Brownfield Estate pays testimony to the poignancy of some architects who got involved in the rebuilding of East London during the decades following WWII. The complex, containing three buildings: Carradale House, Glenkerry House and Balfron Tower were conceived by Ernö Goldfinger, perhaps mostly known by his Bond’s namesake villain (it’s said that Ernö and Ian Flemming were disaffected neighbours which lead to the later indiscreetly teasing his friend with a such a honourable tribute). The flat I visited was on the 24th floor with amazing views of, errr, Canary Wharf. Like 20 or so other artists, the flat was allocated to a painter who benefitted from Bow Arts Trust initiative to fill the empty premises with creatives aiming at, (1) helping these individuals continue their art practice by offering living-work spaces at a very low rent, (2) preventing the infiltration of rogue elements and particularly squatters. I must say, the view of Canary Warf was breathtaking, not to mention the amount of light filling the living room. It was a smart move by the local authorities I thought, one that promotes the reinvigoration of areas lacking in productive activities and contribute to positive change in poor, disenfranchised neighbourhoods. However, this can also mean a first step towards gentrification, I sensed. According to Open-City organisers, Tower Hamlets Council is planning a total refurbishment of the building meaning, relocating artists and, pushing the vast majority of residents out. It is clear that the architectural value of the complex along with their proximity to the financial district of Canary Warf make for an extremely profitable opportunity. For better or worse that’s the London way. I was eagerly awaiting for the London Open House (now rebranded as Open-City) that took place last weekend to have the chance to look inside some of those outstanding examples of architecture that we sometimes admire in awe when walking around town. No doubt my first option was a private flat at Lauderdale House, in the magnanimous Barbican state, which, for my disappointment, was unexpectedly cancelled by the organisers… Notwithstanding, I was keen on catching up with something as there were plenty of other interesting places to see such as the world-renowned Lloyds building, which fit the bill very well. 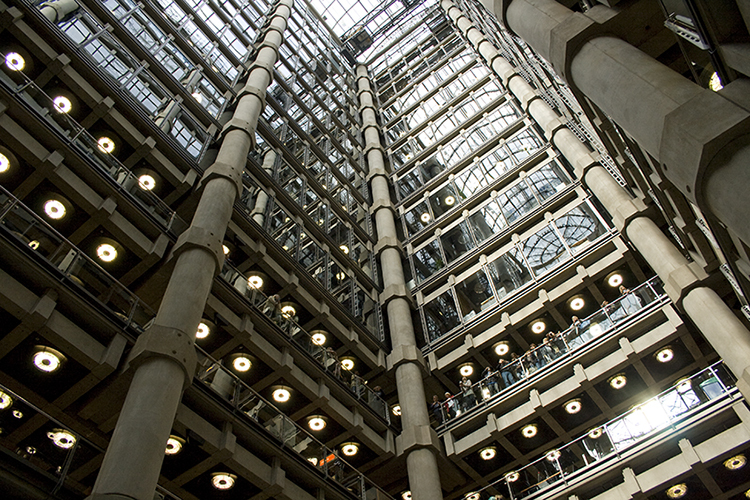 It’s impossible not to draw references to Archigram when looking at the Lloyds’ façade, for example. In fact, that is precisely the type of construction they would have pursued should any of their freaking crazy concepts have come to fruition. Instead, Richard Rogers took from where Archigram left and created a memorable piece of space-age architecture. What strikes me most is the fact that Lloyds started out in a mere coffee house on Tower Street in 1688, and over its 322 year history it has become the largest insurance market in the world. Originally dedicated to insuring risks for Maritime enterprises of all kinds (and yes, slavery trade too, regretfully) it grew to a structure of £2bn worth in assets. So, the bigger the numbers the bigger the need for accountability, right? The impression the building left on me was that besides its sheer dimensions there’s sense of openness that Rogers tried to create by means of vast open plans, and the use of certain materials such as glass in its interiors. It is almost as if the building’s structure, with its apparent pipes and ducts (80km of it, to be precise), open plans, glassed walls and a massive atrium work as statement about transparency and foresight. It’s like exposing the engine of this complex mammoth that is insurance business. However unappealing the idea of working side by side with brokers and the like day after day I could not help but think how damn cool it would be to have an office in that place. If only creative industries were capable of generating similar amounts of revenue then maybe we would see something like a Pompidou-esque building being erected by the Thames to house the ‘creative syndicates’ operating in the ‘visual communications market’ or, the economies of the future. For now though, not much we can do other than make the most of the premises in one of the famously converted warehouses/wharfs pinpointing Shoreditch and Clerkenwell. Right, I shall concede it holds its charm too.